Once the gem of the tiefling empire of Bael Turath, Vor Rukoth fell into ruin and was lost. Now rediscovered, the ancient city draws heroes and villains to its shattered streets in search of treasure. Monsters and intrigue abound in this cursed place, protecting its deepest secrets. Visitors must tread softly, lest they invoke the wrath of Vor Rukoth's undead lord, Queen Najala. If you're a Dungeon Master looking for an exciting adventure location that fits easily into your Dungeons & Dragons campaign, this book is for you. It features dozens of adventure hooks, a variety of unique items and threats, and a full-colour, double-sided battle map. 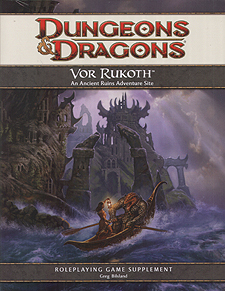 Herein you'll find threats for adventures from 5th to 15th level, making Vor Rukoth a location that characters can visit again and again. Player's Handbook, Dungeon Master's guide, Monster Manual, D&D Miniatures and D&D Dungeon Tiles.